On September 12th, Awareness of Placement opens to the public in the Lodge Gallery at 1532 SW Morrison St. 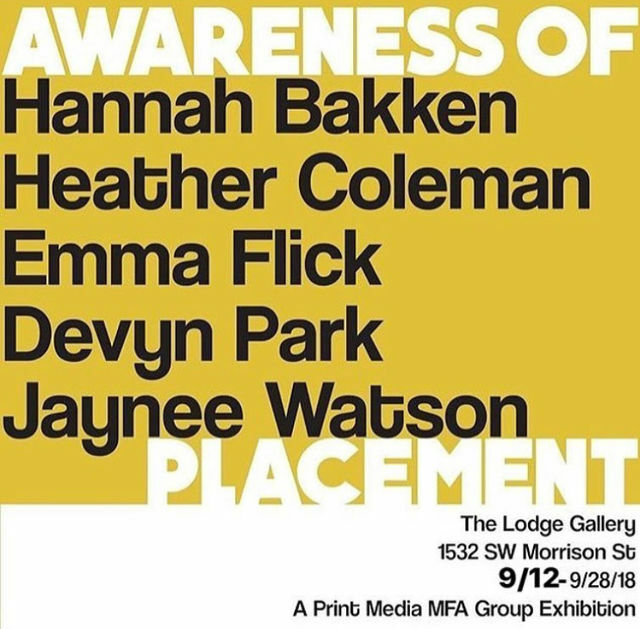 Featuring works by 2nd Year Print Media MFA Candidates: Hannah Bakken, Heather Coleman, Emma Flick, Devyn Park, Jaynee Watson. Opening Reception September 12 from 6pm-8pm. Examining themes of adaptation, land use, relationships, object permanence, and product placement, these works promote reflection on habits, actions, emotions, and their potential results or residues within our lives.